In 2017, email is still one of the best performing strategies in marketing and has kept growing and succeeding over time. With more and more data available to marketers, they are able to target customers with improved quality in both design and engaging content through carefully segmented messages based on online behavior. However, there is a crucial factor that can be a nightmare for marketers, but is still very important and influences the performance of an email: the subject line. That is why Fresh Relevance has put together this article with the top tips and examples of a subject line that will perform well! If you target your customers with an effective segmentation strategy, you will be able to easily tailor your offers to each customer's needs and wants. People always have needs, you just have to find what it is… whether it’s saving money, finding a place to stay or how to look fashionable, the options are endless. 2) Be creative and relevant in a unique way! Everyone knows the last Friday of the month is payday. Ryanair uses this to their advantage and sends a payday-orientated subject line. Smart twist of words! Following popular events worldwide, and more specifically the Hollywood Oscars, Opodo made their own “Travel Oscars” for offering cheap flight tickets. This is an educational and descriptive subject line with a number in it that is especially eye-catching besides the intense words such as “insanely”. Even me, who is not a fan of avocados, would click and check what they are offering! 3) Personalize the location too! So you live in NY but are receiving all sorts of ads and offers for other locations...happens all the time, right?! I would definitely unsubscribe from a newsletter like that. Don’t wait until the customer gets to this point. It may seem like a small detail, but companies are still not always paying attention to it. If you send the right offers targeted to the right location, there is a much higher chance that your email will be opened, and better yet, might end up increasing sales! Subject lines are similar to calls-to-actions, as in both cases the main goal is to get people to click through. The subject lines that begin with action verbs rather than passive verbs or nouns are more enticing, and can make a huge difference in open rates. 5) Match the number of characters in your “From” name! When writing an email, the “from” name has to be evident and authentic so the customer knows who the email is coming from. However, have you ever thought about the length of it? Each type of device has a different number of characters that they are able to display; the iPhone 4 and 5 can display 23. The iPhone 6 and a Samsung Galaxy S4 can display 32. However, it’s probably best if you stick to 23 just to be safe! 6) Always use an accurate description! No matter how stylish your emails are, if you don’t display accurate content of the email in the subject line, your subscribers won’t get to actually see that amazing design of yours. Or, in the worst case they will, but they will be disappointed and you won’t be credited for your words afterwards. When you ask a question, you are engaging with the recipients to increase their interest. 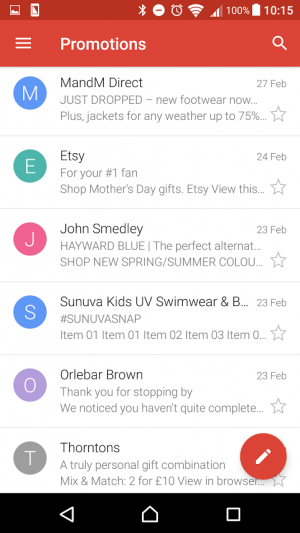 Customers will be more excited about opening that email and answer whatever you asked them. For example, asking their opinion about which do they think is the best Greek island for them is something that can result in massive engagement results, which is, as we all know, the first step in the buyer’s journey to a successful end. Sending Cart and Browse Abandon Emails can be really important when wanting to gain back customers' attention or wanting to remind them they have left products in their cart. Subject lines such as "10% off | We miss you…and so does your cart" or "Out Of Sight But Still On Your Mind?" can recover lost customers. Subject lines are so important, there are now technologies out there that help you create the perfect subject lines for your messaging like Phrasee with Artificial Intelligence. Now that you know all the bits and pieces regarding a successful open-rate for your next email campaign, let Fresh Relevance guide you through making it all happen and phrase the best catchy subject lines for your triggered email campaigns that will also result in a completed transaction! Segmentation, Web and Email Personalization and targeting the right message to the right customer are just some of our expertise, so please don’t hesitate to contact us for further details!